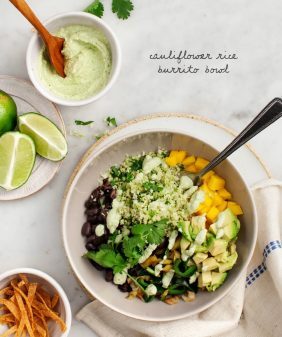 I love this grain bowl for a quick dinner or healthy lunch. Save leftover components for bowls the next day or the recipes in our 5-day meal plan! I know, meal preparedness is ALL the rage on the internet lately, and maybe you don’t need new ideas – but here’s the thing: I do. We’ve been super busy lately, and although our work is all food-related, you might be surprised to know that as a food blogger, things tend to be “feast or famine” around here. There’s way too much food in the fridge or there’s no food in the fridge, depending on what we’re working on. I often talk about cooking components on Sundays when you may have extra time to make big batches of things. I like this approach, but this week I’m doing something a little bit different. 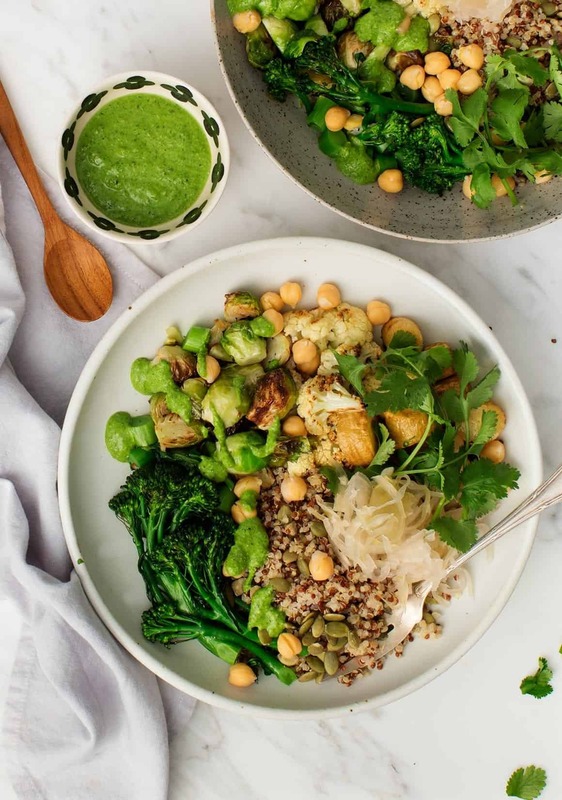 Starting with one meal – this yummy, easy Mean Green Grain Bowl that we ate for dinner last night – I’m going to transform the same components into a new dinner every night for 5 nights so that each new meal builds off of the previous one. The best part of this grain bowl is the yummy sauce! It’s a riff on the kale pistachio pesto sauce that I made a few weeks ago, but this time I made it with pepitas. Even if you’re nut-free you can play along! Spring is on the horizon, even though it doesn’t feel that way, so I used this spring-but-not-quite-yet feeling as inspiration. I roasted a mix of broccolini (to represent spring), cauliflower, and hearty parsnips (because it still feels like winter). Then, I added in chickpeas & quinoa for protein and a little sauerkraut for pop. With these components, I made 2 servings of this grain bowl and saved the leftovers for the next meal. Check back tomorrow and each day this week to see what I make next. At the end of the week, I’ll post a recap of each meal and a shopping list. This Mean Green Grain Bowl can be easily prepped ahead of time for packed lunches or easy weeknight dinners. Don't skip the sauce here! 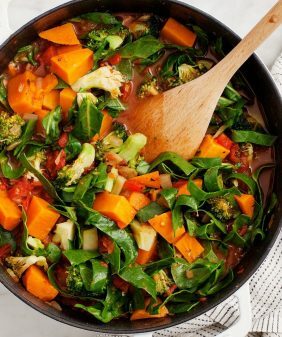 It adds a wonderful freshness to this hearty bowl. First, make the quinoa. Add the rinsed quinoa and water to a medium pot. Bring it to a boil, cover, reduce the heat, and simmer for 15 minutes. Remove from the heat and let it sit, covered, for 10 more minutes. Fluff with a fork. This will yield about 3 cups; I used a heaping ½ cup per bowl. Next, make the sauce. 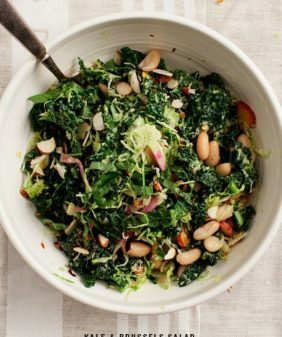 Combine the pepitas, garlic, kale, cilantro lemon juice, sea salt, pepper, olive oil, water, and maple syrup or honey in a blender and blend until smooth. Then, roast the vegetables. Place the parsnips, Brussels sprouts, and cauliflower on one large baking sheet. Place the broccolini on the second baking sheet. Drizzle the vegetables with olive oil and pinches of salt and pepper, toss to coat, then spread evenly onto the sheets. Roast the parsnips/Brussels sprouts/cauliflower 20 to 25 minutes or until golden brown around the edges. Roast the broccolini for 10 to 12 minute or until tender. When cool to the touch, chop up the broccolini stems. 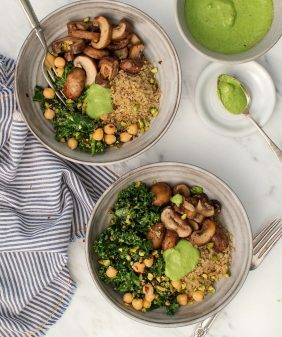 Assemble bowls with a scoop of quinoa, the roasted vegetables, about ¼ cup chickpeas, and a scoop of sauerkraut and top with pepitas. Drizzle with the sauce. Season to taste with additional salt and pepper, if desired, and serve. I assembled these components into 2 bowls (although the whole recipe will make 4) and saved the leftovers for tomorrow’s dinner - stay tuned! Store the extra sauce, quinoa, and remaining chickpeas in the fridge. I’m so excited about making this, I want to toss my to-do list out the window and head to the kitchen right now! ABSOLUTELY delicious! Grabbed the ingredients and made this for dinner tonight. Excellent flavor. The only changes I made were to use red sauerkraut and broccoli (vs broccoli). Nervous how hubby would feel about a meatless meal I dry-poached some organic chicken breasts and added that. Two thumbs up!!! 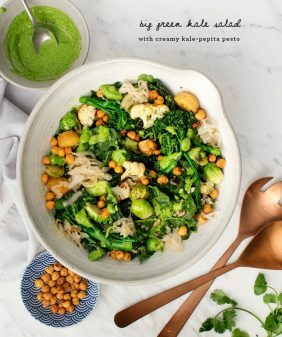 The Creamy Kale Pepita Pesto looks amazing!!! As an salad addict, I always try something new everyday. This is amazing! So easy and delicious. 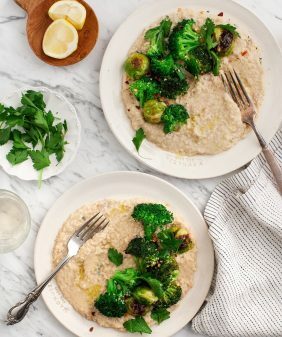 Thank you so much for this great meal plan – it is so good to learn how to put things like this together and very budget friendly (even in NZ where groceries can be killer!) Very grateful – thanks again!!! Solid meal tonight! Looking forward to tasting the remaining installments! This pesto is a delicious way to brighten up the roasted veg and grains (I used faro). It’s very easy to make.